Enjoy the a base of tiger's eye pelted with a rainbow of colorful gemstones. 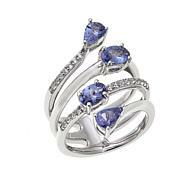 It's a fabulous ring that stands out from the rest. Slip it on and enjoy this unique, signature-worthy piece. I went back and forth wether to order this ring . I love Carols curations and have collected several pieces. While I have loved every piece in the past I wasn't sure this one would work for me. It arrived today and its a keeper! 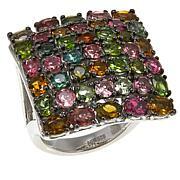 The faceted gemstones are super quality with nice color & sparkle. 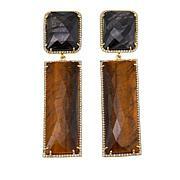 They really pop off the sleek tiger eye. I ONLY wish there was something similar in a bracelet. I dont wear matching pieces but would love to see something like this for my wrist! Get busy Carol! This ring is nothing less than stunning. I have onl6 had it for a few days but have already received several great compliments with my favorite being asked if I had it custom made. It doesnt get any better than that. If you are looking for statement jewelry, look no further. I saw this ring on TV and thought it was a weird combination. I thought I'd order it just to see in real life....I must say, it is one of the most stunningly beautiful rings I own. Nice, large tiger's eye--beautiful multi-gemstones. I simply love it! This ring is a masterpiece. I absolutely love the cut of the center gemstones. The tigers eye is beautiful and shiny. The combination of casual tigers eye and fancy cut gemstones, the varying sized gemstones, the staggered layers of gemstones are just a few of the reasons I LOVE THIS RING!!! IT US TRULY A WORK OF ART. Very comfortable on my first finger. Unusually beautiful and unique. I can wear this with my tiger eye necklace with the agate and labradorite. The gems are not large but it is noticeable and colorful.